Kids have the clearest heart and that we can all see it through their actions. They are not just the cutest but also are extremely kind untouched of any filth or corruption. Their innocence speaks for them, and they make us believe in humanity every time. 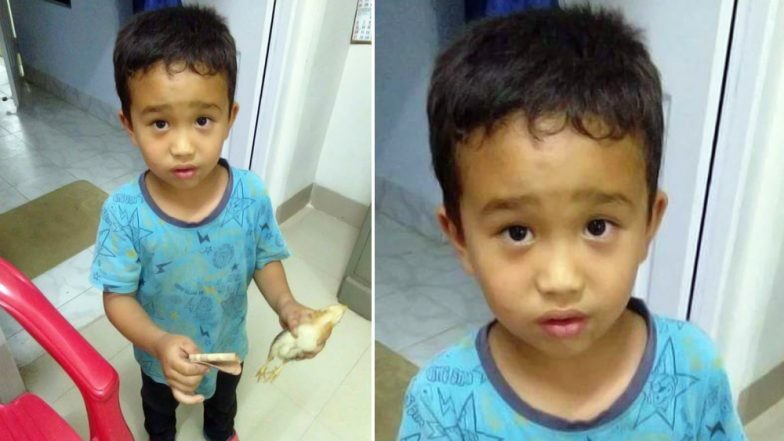 The most recent case that acts as a perfect example is this little boy from Mizoram who accidentally ran over his neighbour chicken but didn't run away from the situation, in fact, the guilt-ridden boy took whatever money he had and rushed to a nearby hospital. This incredibly kind boy's picture is doing rounds on the internet, and the picture will tell you the complete story. In the picture, you can see this boy with the cutest guilty expression and little money in one hand and the baby chicken on the other. Mom’s Heart-Warming Facebook Post About a Man Who Offered His First-Class Seat For Her and Her Baby Goes Viral. The moving picture was shared by Sanga Says on Tuesday with a caption that reads: "As per Reports: This young boy from Sairang, Mizoram, accidentally ran over his neighbour's chicken with his cycle. He took the chicken, ran to the nearest hospital and with all the money he had, asked for help. (I'm laughing and crying all at the same time.)" We agree, the picture does bring tears of joy in the first glance. The post is flooded with comments, and the picture has gone viral now for all the right reasons. "There’s so much to learn from children than from grown-ups," a comment read. Another comment read: "This kid has more sense of responsibility than most adults. Salute to your parent's kiddo."